Before my summer vacation, I was tagged by the Baby Rambutan, Stel, for this meme. So here it is finally, a bit late. 2. Last cookbook I bought: The latest cookbook I own, I did not buy but a birthday gift from Jade, who truly knows what pleases me the most. 3. Last food/cookbook read: Still reading…Monet’s Cookery Notebooks by Claire Joyes. Blending Monet’s biography, artwork, and cooking; what could be a better combination? Fanny Farmer Cookbook by Marion Cunningham – the first cookbook I ever purchased for me, and has been my bible ever since. Let’s Cook with Nora by Nora Daza – a gift from a very good friend who is great at Filipino cooking. Old North State Cooking – a gift from my Mother-in-Law, to help me cook the North Carolina way. Great Dishes of the World by Robert Carrier – probably the oldest book I own, found at a rummage sale. I think this tag has found the end of the line. I think most of the food bloggers on my links have been tagged already. If there are any readers out there who haven’t been tagged, please feel free to continue on. Anything for you, Stel 🙂 O I noticed that too when I read your book list. 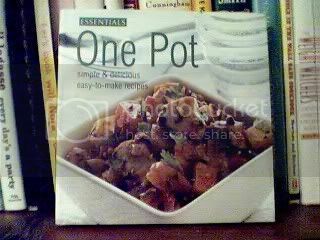 I wish I could get my hands on more Filipino cookbooks. The two that I have are classics, but not many pictures. I’m a visual person eh. I just love cookbooks with plenty of photos. That’s why that Donna Hay book is becoming a fast favorite. Jade and I were just looking through it last weekend. Thanks again!